Height: Up to 90 feet, but usually 30-40 feet. Trunks: Erect, solitary; bark thin, brown to reddish-brown, splitting into long strips; wood red with white sapwood, fragrant; branches erect, spreading or drooping, reddish-brown. Twigs: Pliable, green when young, glabrous. Leaves: Opposite, simple, green or bluish-green, reddish-brown in winter; leaves of mature twigs sessile, scale-like, ovate or lance-ovate, 1/16 to 1/8 inch long, closely appressed, overlapping leaf above; tip sharply pointed; leaves of immature twigs needle-like, 1/16 to 1/6 inch long, widely spreading. Flowers: Male and female inflorescences on separate trees; cones rather than flowers, at ends of twigs. Staminate pollen cones solitary, ovoid to ellipsoid, 1/12 to 1/6 inch long, 1/25 to 1/12 inch in diameter, yellowish-brown, sessile at branchlet tips; pistillate cones solitary, spherical, green, at branchlet tips. Fruit: Berry-like, spherical, 1/6 to 1/4 inch in diameter, surface waxy; seeds 1-3, egg-shaped, 1/12 to 1/6 inch long, light brown, pitted; fruits in September. Habitat: Prairie hillsides, pastures, shelterbelts, windbreaks, roadsides, old fields, occasionally in woods; dry rocky, sandy, or clay soils. Toxicity: Foliage consumption by cattle and sheep may cause small birth weights and abortions. Uses: Red cedar is often observed in shelterbelts where it provides protection from the wind. The trunks have been used for fence posts and the durable and fragrant wood made into furniture, shingles, and handicrafts. Native Americans chewed the berries to treat canker sores and used them as food and to add flavor to soups and meats. The berries and twigs were boiled and the liquid taken for coughs in humans and horses. The twigs and leaves were burned and the smoke inhaled for colds and were used in stem baths to treat rheumatism. The Dakota attached red cedar branches to their tipi poles to ward off lightning. Wildlife use it for cover and songbirds and morning doves nest in it. The fruits are eaten by deer, birds, and rodents and wild turkeys eat the leaves. Comments: Eastern red cedar is an evergreen that varies considerably in form. The crown may be nearly erect in young trees to cone-shaped or round in mature trees. It is a weedy species that spreads aggressively in poorly managed rangeland. It can be controlled by fire when small or by cutting. Red cedar withstands drought conditions and freezing conditions. 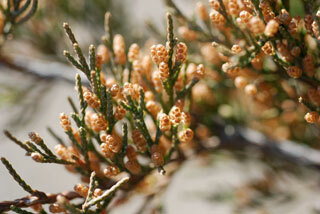 It is often infected by cedar apple rust, a fungus that forms brown balls on the branches and twigs. Reproduces by seed.